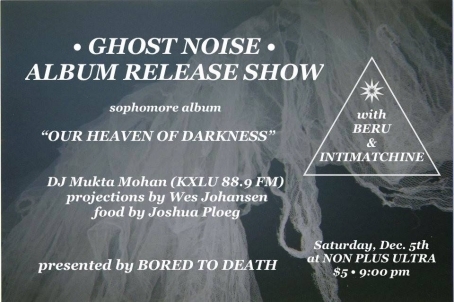 On Saturday, the Ghost Noise album release party drew together acts with unparalleled vigor under one roof, moved by the currents of Wes Johansen and KXLU's Mukta Mohan, and the familiar musk of leather jackets and alcohol. Intimatchine pulled Non Plus Ultra in with its dreamspun pulsations. Once close, Chelsey Rae Holland passed a vial of holy water to the audience, and sat amongst them as she sang. Jessica Nicole Collins' channelled BERU's "Adult Emotions" with her brother and sister-in-law, clad in skull mask and gold leopard jumpsuit. In the spirit of '80s dance, they ended with a cover of Laura Branigan's "Self Control". Josh Dean, Gawby Moon, and John Connolly brought the party to midnight in noise-droning end with songs from their debut and their sophomore release Our Heaven of Darkness. In loving memory of their friends and family and fans, the trio performed "Amethyst" as an encore special — the first song they'd ever written as a band. 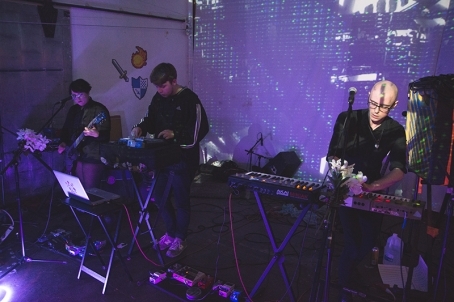 After months juggling studio time, rehearsals, and shows across California, Los Angeles darkwave trio Ghost Noise will release the follow-up to their 2013 debut This is the Next Part of Your Dream. Our Heaven of Darkness, the full-length recorded through 2014 and produced in part with Jessica Nicole Collins (BERU)and Jöseph Solomön Calleirö, comes out this week on December 5th. The Deli reached out to Ghost Noise about what fans new and old can expect from Our Heaven of Darkness. "We're exploring a lot of darker tones on this album," says Gawby Moon. John Connolly adds, "It’s an album born out of a lot of hurt. These are the most deeply personal songs we’ve ever written." Like the sound explorers Keiji Haino and Vashti Bunyan, Jessica Nicole Collins has channeled complex moods through BERU's stream-of-consciousness applique since her 2006 year-end single "Spaces In Time". 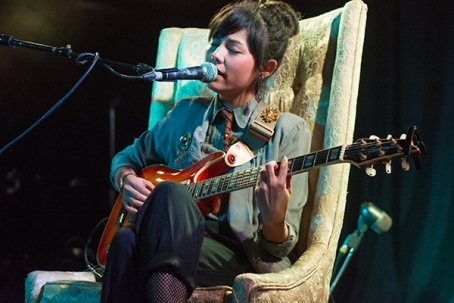 Her live engineered sound collages would completely envelop venues and listeners, emanating existential themes and affectations of world-weariness. But her newest EP “Adult Emotions” is different. Just as the title suggests, BERU’s newest collection is mature in conception: dense and measured, wistful and purgative. But the songs are also an eidetic recollection of innocence in the eye of loss. She tags the release with descriptors like “island goth”, “smooth rock”, “newage”, and “doom metal”, and rightfully so — these influences, and more, are abound in each of the six songs. Collins recites ‘90s adolescence by memory, from Yucatan pan flutes, Miami Vice, “the chillest of beats Enigma used,” and Bryan Adams’ suave guitar-lead auras. The Portuguese have a word that translates to an emotional state of great nostalgia and melancholy: saudade. In Los Angeles, we have a band called Ghost Noise, and we think they work just as well. 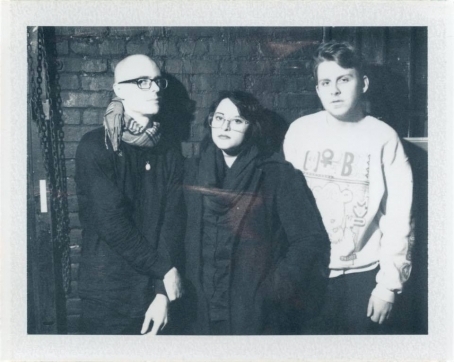 The trio draws from wells of sorrowful sentiment to drive their sound, reminiscent of goth-rock, post-punk, and darkwave bands in the 80’s. But beneath the pastiche of lipstick pickups and Korg patches, there’s a greater force at work. The DIY ethic that propels the group has helped them to travel and thrive from Santa Monica to San Luis Obispo. The members are heavily involved in the local music scenes, managing the music/arts collective Mountair and contributing to other homespun organizations on their spare time.